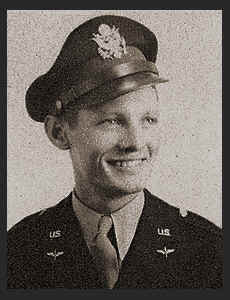 1st Lt. Louis D. Dugan, son of Mr. and Mrs. Lonnie Dugan, graduated from Wilson High School, Okla Univ; husband of the former Theresa A. Roberts. Entered the Air Corps in July, 1942, trained in Sheppard Field, San Marcus, San Antonio, Brady Texas, Frederick, Okla, Shreveport, La; served in N. Africa, italy, France. Awarded pres. Unit Citation, ETO Ribbon with one Battle Star, Am. Theatre Ribbon, Victory Ribbon.